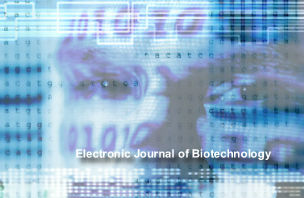 The Electronic Journal of Biotechnology is an international scientific electronic journal which publishes papers from all areas related to Biotechnology. It covers from molecular biology and the chemistry of biological process to aquatic and earth environmental aspects, as well as computational applications, policy and ethical issues directly related to Biotechnology. Molecular biology, genetic engineering, microbial biotechnology, plant biotechnology, animal biotechnology, marine biotechnology, environmental biotechnology, biological processes, industrial applications, bioinformatics and others are some of the main subjects considered. Also short communications a welcomed. All contributions should be concise and written in English. Electronic Journal of Biotechnology has no page charges. Authors must assure that no part of the article has been published nor submitted for publication elsewhere.